Dear art teacherin' friends...ARE WE THERE YET?! Oh man, I dunno about you but I am so ready for a wee breakie. If anything just so I can clean this art room and start planning fresh and new projects. If you need some quick and winter-y projects to make to the gloriousness that is Winter Break (or need something upon our return!) have I got some art-makin'-mayhem for y'all! 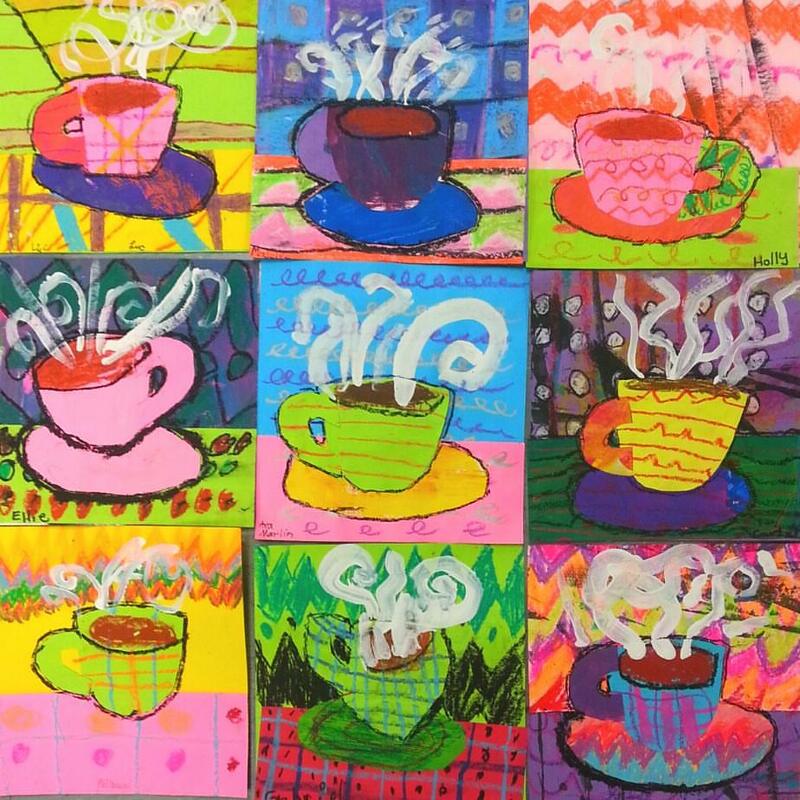 Let's start with these Heather Galler-inspired hot chocolate creations by my second grade students! 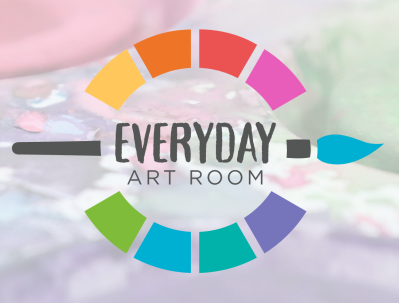 Heather Galler is a contemporary artist whose colorful artwork is always super fun to introduce students to for inspiration. We created our Dot Day trees last year with her work in mind. 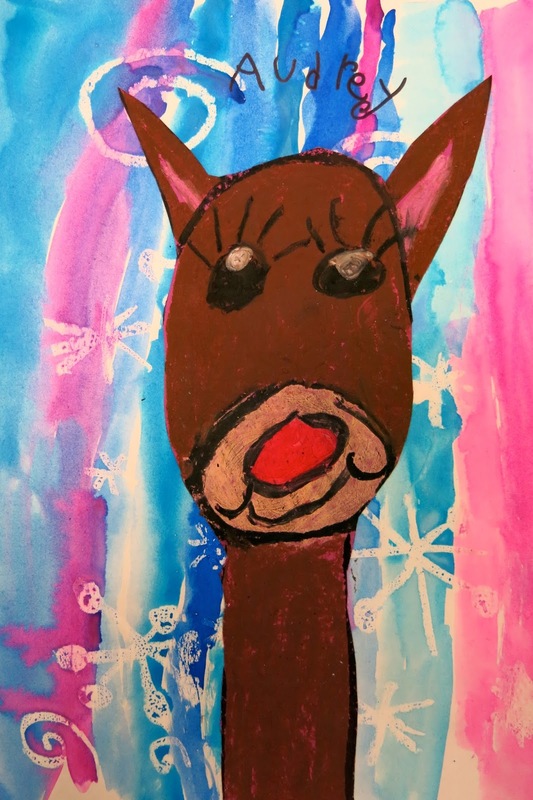 This project only took us about two thirty minute art classes...and that's with a hot chocolate party to celebrate our good behavior in-between! Using 8" X 8" squares of scrap and painted paper, we created patterns. 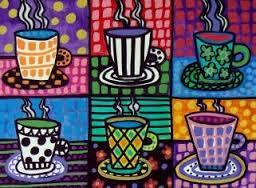 I really emphasized that patterns are made by a repetition of the elements of art like line, shape and color. We used oil pastels. On a 3" X 8" sheet of scrap paper, more patterns were created. We chatted about using a contrasting pattern and color to allow the designs to stand apart from one another. The following class the kids used a cup, saucer and handle template that I cut from a manilla folder, the kids cup, designed and glued the rest into place. Patterns were added if desired. To emphasize the cup, they were traced in black oil pastel. This was also a nod to our Heather Galler inspo. We added steam to our cups with a thin brush and white paint. Our final step was to add our names! They now proudly hang in the hallway. Of course I always end up with the one random class that happens to be a couple of days ahead of the rest. To allow them time to explore materials and create in a short amount of time, a second grade class worked on these cute dudes. 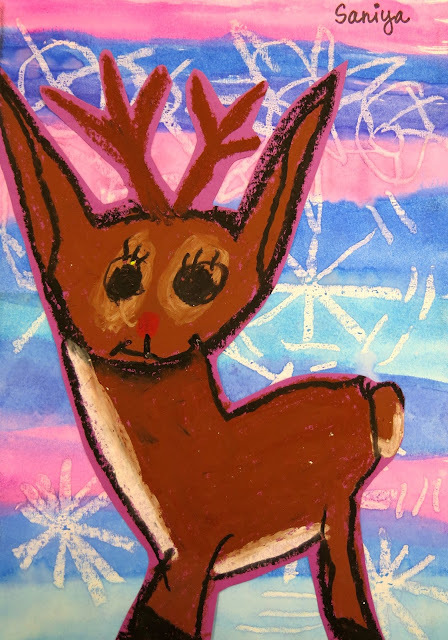 On their first day, they used 9" X 12" paper and created an oil pastel resist with white snowflakes and the cool colors of watercolor. On our second day, we did a quick review of how to draw animals using shapes: oval for the body, rectangle neck, circle head and rectangular legs. Details were added as the kids saw fit. These guys were then cut out and glued to the background. 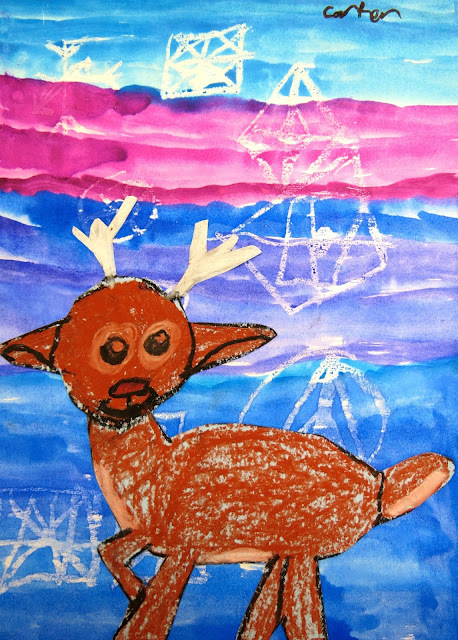 Kindergarten created these sweet reindeer in the same fashion. On the second day of art class, we drew together with brown, peach and black oil pastels, emphasizing shapes and lines. We began with a peach oval for the muzzle. From there we added an arch for the top of the head which was colored in. Triangles were used for ears and a rectangle neck. We always use black last because it can smear so easily. These were then cut out, glued down and signed by the artist! 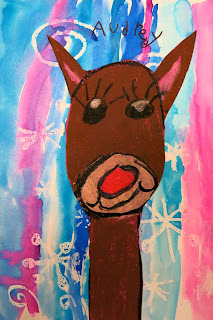 First grade has been going through all of the elements of art and this lesson was great at introducing texture. I busted out the texture rubbing plates for these and the kids used oil pastels to create a background. Once the entire paper was covered in texture, a white oil pastel was rubbed over the entire sheet to make the colors more muted. We chatted about the three parts of a landscape, fore-, middle- and background, and added those with oil pastel. Our final step was to paint light green triangle trees (with the largest being the closest, getting gradually smaller as they fade to the background) with dark green texture. The following art class, the kids were shown how to draw a deer using shapes, much like my second grade class. 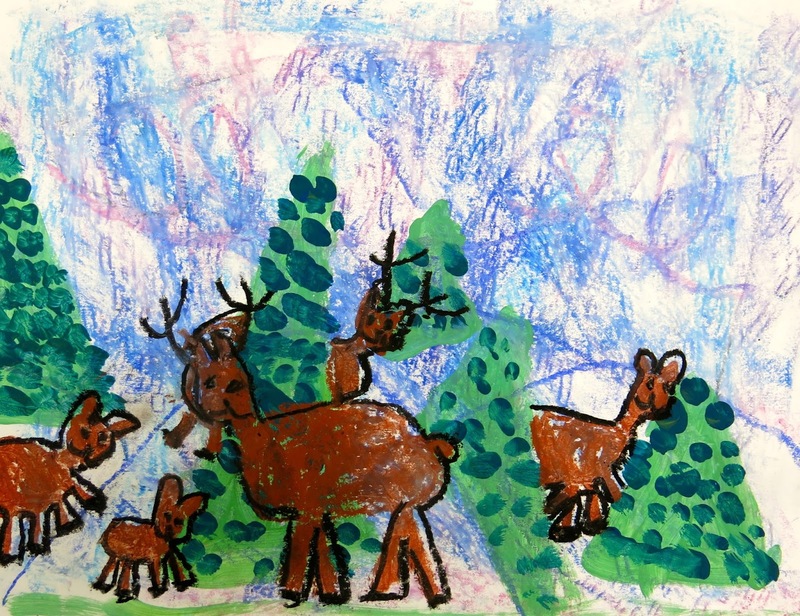 These children had the time to add as mean deer as they liked. I am in love with the one peaking out from behind the tree! I only had one art time with this particular kindergarten class so we weren't able to make deer. Instead, we busted out these sweet penguins which introduced much of the same concepts! Together, we drew the penguins on white paper in oil pastel. You can see the steps and another version of this project here. From there, we used the cool colors and practiced out painting of spirals! It's not easy for the wee ones to have such control over their brushes and create such delicate lines. I was pleased with their hard mad skillz! I shared this second grade lesson just last week! In case you missed it, check it here. Of course, for some variety, your students could create baby polar bears! I am so super glad I found you, everything you do is inspirational, and if I now get asked who Inspires you,Cassie Stephens, that's who. I really want to start making dresses and or big amazing in your face skirts. 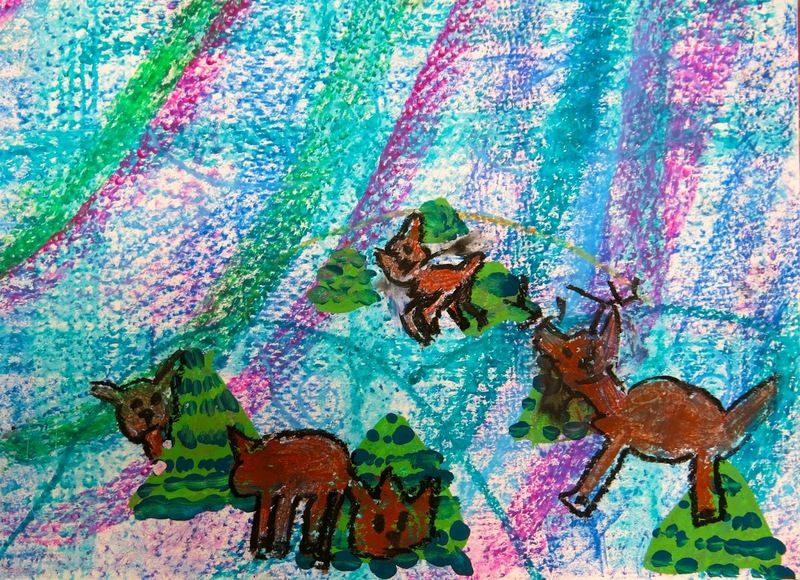 I volunteer art classes for kids, but would be a dream to be an actual art teacher for primary school kids. You are too sweet and I so appreciate your kind words! 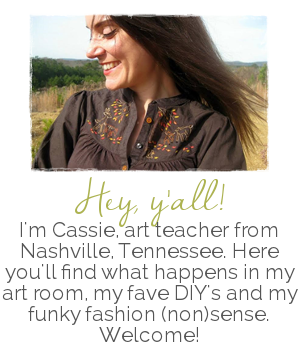 One of my biggest inspirations comes from my good friend and blogger Laura Lohman over at PaintedPaper blog! 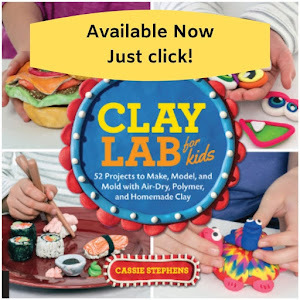 I know you'd love her projects! Keep the dream alive, I know you can do it!! Oh yes, I'm with ya, nothing above the knees...that's where the shaving stops ;) I really like Simplicity patterns for their, you guessed it, simplicity. I would start by searching their website and see what catches your eye. And no, you don't need a hem machine (serger)...just fold the hem once...and then twice to have a clean hem with no hanging strings. A website that REALLY love for sewing help is called Professor Pincushion. She will actually walk you through an entire dress pattern! 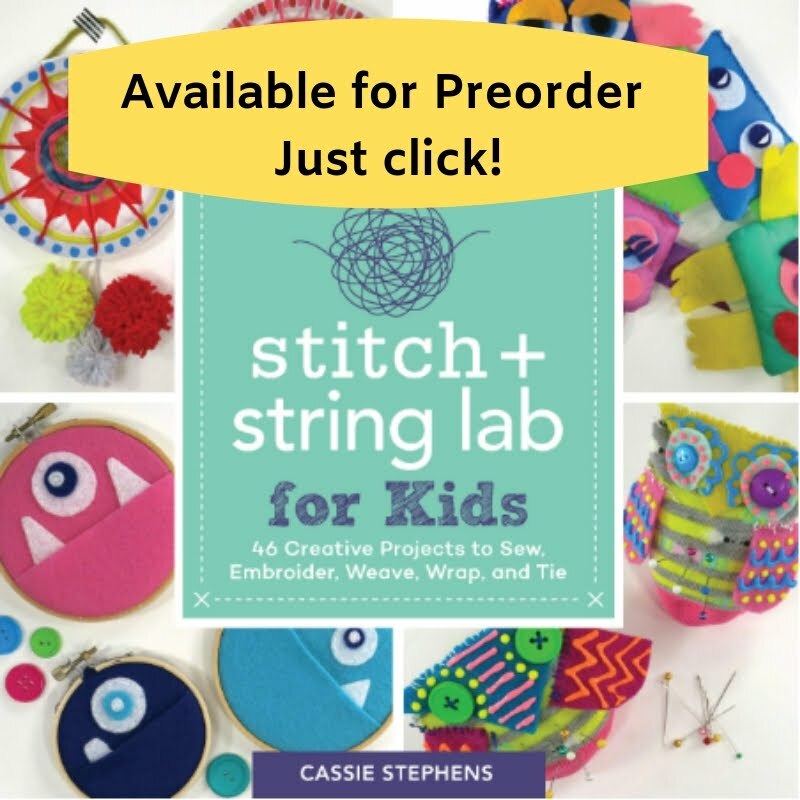 Maybe look at her options and pick one the patterns that she has sewn so you can stitch along with her. I've used her videos many times when sewing patterns have me stumped and I love her! Have fun!! xox! Thank you so much for all your advice, and yes you will be seeing my comments float round more often.your YouTube channel is especially educating. Have a beautiful and safe Christmas and God bless. (Darts to proff pincushion..) Get it darts..haha. Classic. I just read your post this morning, only to see that two of your lessons we just finished in our art room!! 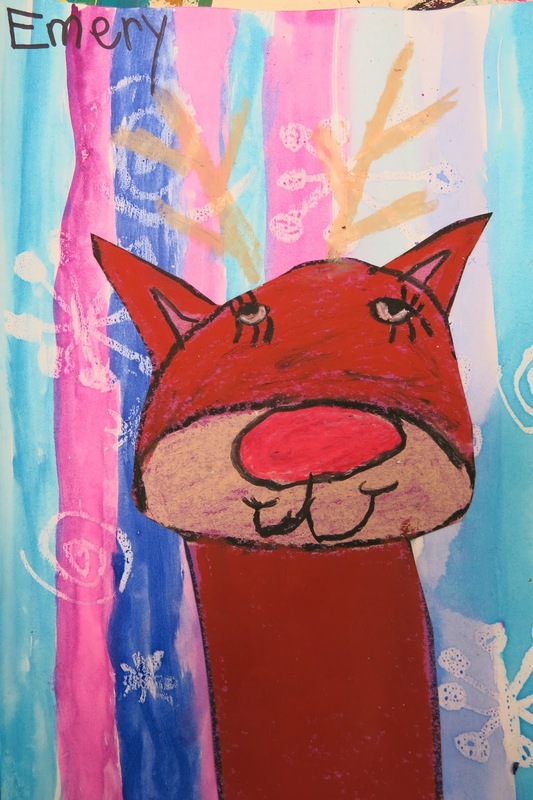 I love that- great minds... Heather Galler's art is super colorful and fun and every grade seems to gravitate to her work-related which means less talking for me and more released creativity for them :-) have a wonderful winter break! DIY: (One Last) Tree Skirt to Lady Skirt, Y'all! DIY: Vintage Putz Houses, A Light Up Village! 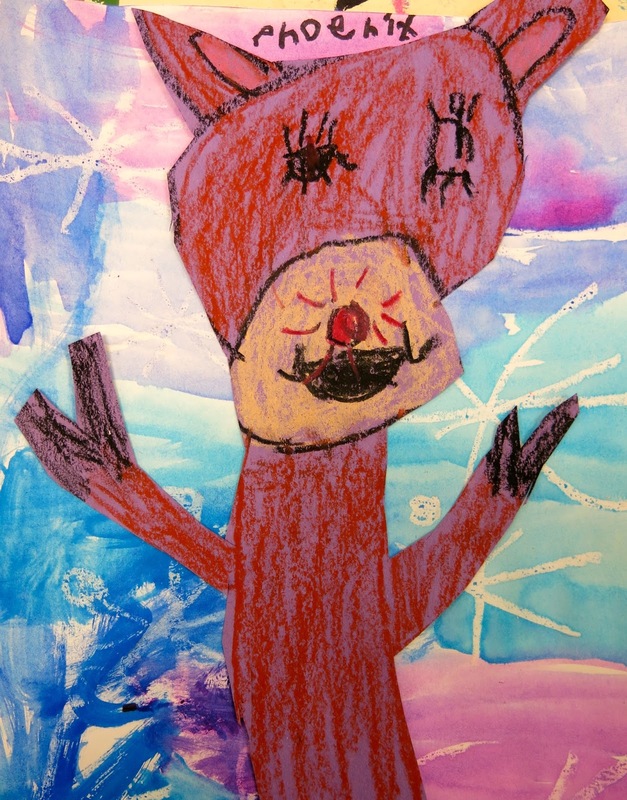 In the Art Room: Winter Mixed Media Masterpieces!